Items of a personal nature (personal gear,telephone calls,beverages,internet,laundry etc). Trashichhodzong: This impressive fortress/monastery houses Secretariat building, the throne room of His Majesty, the King and various government offices. It is also the summer residence of Chief Abbot and central monk body. Then, visit the government-run Handicrafts Emporium and local crafts shops, to browse through example of Bhutan's fine traditional arts. Here you can buy hand-woven textiles, thangkha paintings, masks, ceramics, slate and wood carvings, jewelry, interesting items made from local materials. Later leisure time at the hotel. Today we head for Gangtey, about 150 kilometers away from Thimphu. En route, stop at Dochula Pass where you will have a coffee break while appreciating the striking view of Mt. Himalaya. You will also visit the grand 108 stupas. After that, we continue driving to Gangtey. It is a beautiful and tranquil place surrounded by lush forests. This evening remains free for you. If you are interested, you can stroll around the Gangtey Valley and pay a visit to the exquisite Gangtey Goempo. 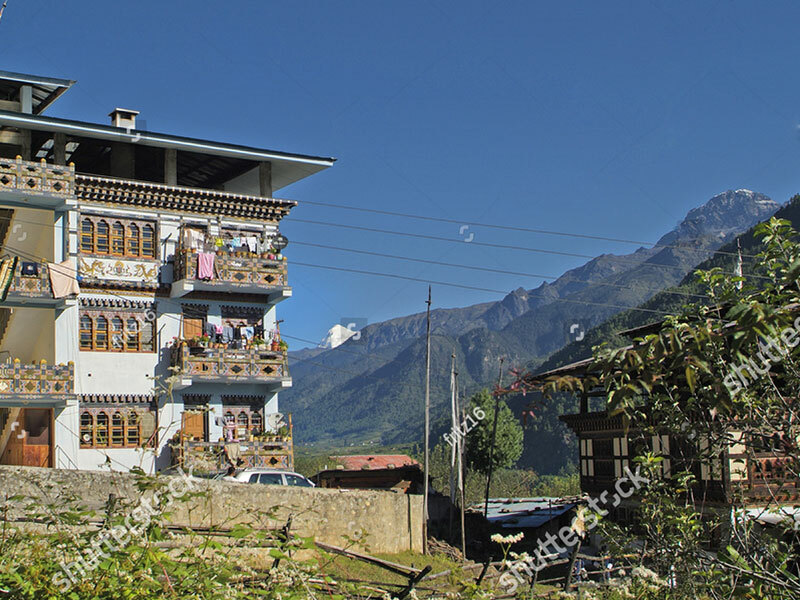 Today drive back to Punakha, on the way hike to ChhimeLhakhang, lies on the periphery of the expansive valley of Lobesa where the borders of Thimphu, Punakha and Wangduephodrang districts meets. Perched on top of a little hilltop overlooking the Puna Tsang Chhu. It is widely known today that most of the thousands of people who visit the lhakhag do so to pray for children either to ask for children by those who are childless or to seek protection for children that they already have. While ChhimeLhakhang is renowned for its fertility blessings, it also fulfils the other religious and spiritual needs of the people. After lunch visit Punakha Dzong. ZhabdrungNgawangNamgyel, the founder of Bhutanese state, built PunakhaDzong in 1637. 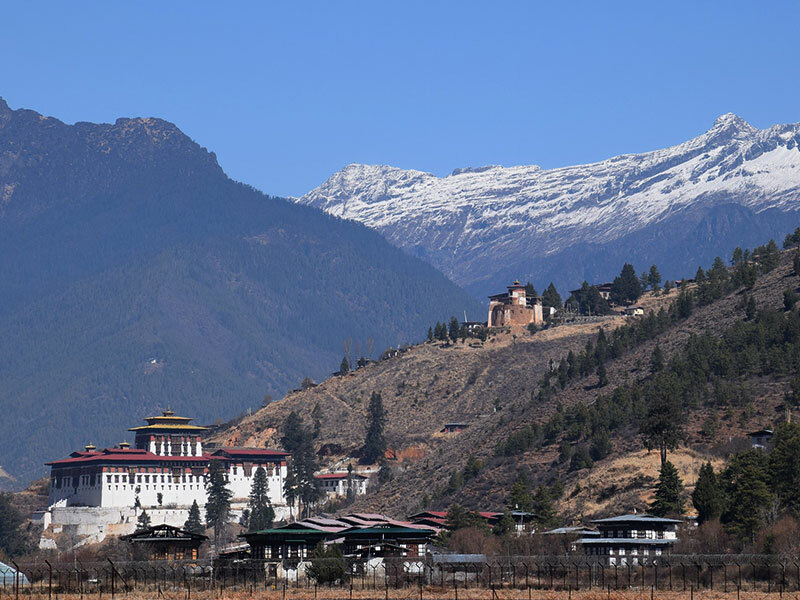 It was originally named PuntangDechenPhodrangDzong, which means the Palace of Great Bliss. Punakha Dong was built on the 8th day and 8th month of the Fire ox year in 1673. The Tibetan attacked the dzong in 1639 and 1644. The defenders successfully repelled the attacks. To commemorate the victory, a New Year festival was introduced and Yu GyalGonkhang Chen Mo, "the great shrine of the protective and victorious lord" was built. The first King of modern Bhutan was crowned in PunakhaDzong. PunakhaDzong remained the centre of government until it was relocated to Thimphu. In 2011, the wedding of the 5th King was held in this fortress. 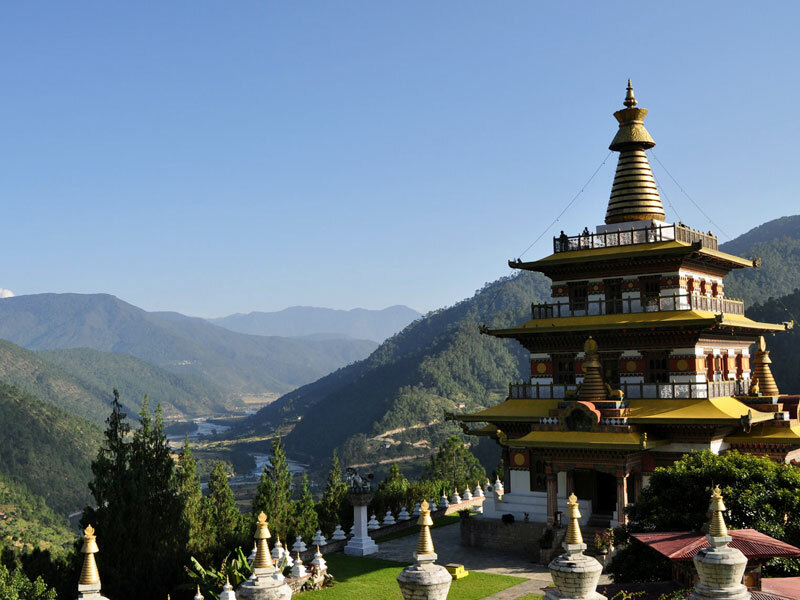 After breakfast hike KhamsumYulleyNamgyalChorten stands out on a beautiful ridge above the Punakha valley. Her Majesty built the Queen Mother, AshiTsheringYangdonWangchuck it. It took 9 years to build and Holy Scriptures rather than engineering manuals were consulted to construct this 4-storey temple. It is a fine example of Bhutanese architecture and artistic traditions. This temple has been dedicated for the wellbeing of the kingdom, its people and all sentient beings. It is a 30mins hike from the suspension bridge.The Chorten would take a one-hour hike to approach. It offers a beautiful view of the Punakha Valley. After lunch walk across the suspension bridge through absolutely fresh breeze and fascinating view of Dzong. Folow the farm houses gradually climbing towards Dompala hills. The view of Dzong , Pho chhu, Mo chhu(rivers) and surrounding village is superb amidst chirpine forest. The climb is another two and half hours to Limbukha. Limbukha farmers grow Bhutan’s Famous red rice which is supposed to have medicinal values. This particular rice needs clean mountain spring so that the taste is good and nutritional values. Transfer to Paro . Afternoon visit Ta Dzong, inaugurated as National Museum in 1968, and holding a fascinating collection. After that walk down the trail to visit Rinpung Dzong, also known as "fortress of the heap of jewels". Built in 1646 by Shabdrung Ngawang Namgyal , the first spiritual and temporal ruler of Bhutan. Evening visit Kyichu Lhakhang, built in 7th century, is one of the two oldest and most sacred shrines in Bhutan (ther other being Jambay Lhakahng in Bumthang). Embark on a long hike to one of Bhutan’s most revered icons, Taktsang (also known as Tiger’s Nest Monastery), perched 3,000 feet above the valley floor. Far from being a monument, it is a living, breathing monastery, home to a handful of monks. Hang a prayer flag to send Buddhist blessings via the winds. Afterward, enjoy a lunch overlooking Taktsang. After lunch visit the ruins of DrukgyelDzong. It was from here that the Bhutanese repelled several Tibetan armies during the 17th century. The Drukgyel Dzong in Paro was built in 1649 to commemorate the victory of the Bhutanese over the allied Tibet-Mongol forces. Drukgyel means ‘the fortress of victory’. A fire caused in 1951 completely destroyed the Dzong, what now remains are tokens of a haunted house, still robust walls and charred remains of gigantic wooden posts and beams.